It is the time of the year when I am called upon to cast my vote in the annual ballot for who should pass through the gilded doors of the Rock And Roll Hall of Fame, an annual task that I try to take seriously even though I have increasing doubts about its integrity. These doubts stem from the realisation that for reasons unexplained various acts that I would like to see inducted – invariably British ones* – are never nominated, and that the need to induct a minimum of five new nominees each and every year unavoidably results in a decline in standards. According to the R&RHoF’s website no fewer than 323 acts have been inducted since the show got on the road in 1986. The early inductees, of course, included the cream of the crop – Elvis, Chuck, Buddy, Beatles, Dylan, Aretha, Stones, Who, Kinks, Cream etc – and along the way, as the 25-year rule comes into play (you can’t be nominated until 25 years after your first record is released) all the major acts you’d expect – Hendrix, CSN&Y, Zep, Elton, Jackson, M., Bowie, Springsteen, U2, R.E.M., Prince, Madge etc – have sailed in, as you would expect. To use a football analogy, these and maybe a few others represent a sort of Premier League, I guess, but after a while it seems that the anonymous – some might say obsessively secretive – nominating committee find themselves obliged to spread the net wider and wider, into the Championship and then Divisions 1 and 2. So I have to ask myself whether those nominated more recently – perhaps, heaven forbid, to make up the numbers – are really worthy to stand alongside those nominated in the early days. Maybe it’s now time to establish a Hall of Eminence corner away from the rank and file so as to distinguish between the Premier League and the rest, with entry restricted to just one nominee each year though not necessarily one every year. With this in mind I turn to the 15 names on this year’s nomination form, none of whom would enter my Hall of Eminence, not yet at any rate. They are The Cure, Def Leppard, Devo, Janet Jackson, Kraftwerk, LL Cool J, MC5, Stevie Nicks, John Prine, Radiohead, Rage Against The Machine, Roxy Music, Rufus & Chaka Khan, Todd Rundgren and The Zombies. 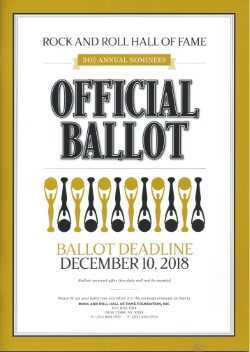 Seven of these 15 acts (LLCJ, Radiohead, Rufus+CC, Zombies, Janet J, KW and MC5) have been nominated (but not inducted) before, some more than once, which implies that those charged with coming up with the nominees are either running out of names or determined that some among this number will finally get in. I have five votes and of those previously nominated I voted in the past for Kraftwerk and Radiohead. I shall do so again, for reasons stated earlier. Viz 1, Townshend’s work on Who’s Next aside, Kraftwerk’s pioneering use of synthesisers is the foundation for modern dance music and in addition they wrote some lovely, sensuous melodies, of which ‘Europe Endless’ and ‘Neon Lights’ are supreme examples. Viz 2, I know Radiohead can be miserable old buggers and, if not restrained by the more level-headed among them, a tad on the pretentious side but they’ve made some wonderful music over the years and OK Computer really was one of the best albums of the nineties. That leaves me with only three more votes, and it’s not easy whittling them down as, unlike in previous years, there’s a superfluity I’d vote for given the chance. Out of the running immediately are those who for no fault of their own are not really to my taste (Def L, Devo, Janet J, LL Cool J, RATM and Rufus+CC – and it’s no coincidence that of the 15 these are the only six whose records I do not own), which leaves The Cure, MC5, Stevie, Prine, Roxy, Todd and The Zombies. I’ve always had a soft spot for Robert Smith’s offbeat weirdness, MC5 deserve to be in for politics alone, Stevie’s a trouper, John Prine is a truly wonderful songwriter, Roxy thrilled me when I first saw them, Todd Rundgren has served his time honourably (and I can’t believe he’s not already in) and The Zombies deserve a shot, even though they’re not really in the top league… see above. And Roxy Music. I saw them in 1972 or ‘73 at London’s Rainbow and I’ll never forget how Bryan came out singing ‘Do The Strand’ dressed as a toreador, a red and black outfit with epaulettes and frills, and how he just blew Roy Hollingworth, who was sat beside me, and myself away. I saw them a few more times after that in those early years and they failed me only once, in 1972 at the Lincoln Festival where they were unsuited to the great outdoors. But I’ll forgive them that glitch and put an X in their box because before they even had a record out we stuck them on Melody Maker’s cover (exactly 46 years ago this month, as it happens), thus spreading the word which I’ll continue to do. So who’ll be my fifth choice? In the past I have left my final vote open to readers of Just Backdated and I will do so again, so who should it be? Answers below. I have four weeks to make up my mind before my ballot needs to be posted. * Three that spring to mind immediately, from opposite corners of rock’s great triangle, are Tom Jones, Richard Thompson (and/or Fairports) and Slade. Myths and legends are strange bedfellows. In the Oxford English Dictionary a myth is defined as ‘a widely held but false belief or idea’ while a legend is ‘an extremely famous or notorious person, especially in a particular field’. Peter Grant straddles the two and, perhaps bearing this in mind, Mark Blake prefaces his biography of the man with a quote from Oscar Wilde, ‘The truth is rarely pure and never simple’, which is both astute and playful at the same time. The problem with writing about Grant, a man I knew but not well, is how to separate fact from fiction, yet at the same time produce a readable book that entertains sufficiently to make you want to keep turning its pages. Bring It On Home did that alright, largely because instead of being pedantic about separating fact from fiction Blake has wisely allowed his readers to make up their own mind about a few of the more outlandish claims that were made by, or on behalf of, Grant. Was he raised in abject poverty? Probably. Was he amongst those who dangled Robert Stigwood from a fourth floor window? Maybe. Did he carry huge wads of cash? Yes. Did he address as Popeye an American sailor who hassled Jimmy Page? I hope so. Was he as violent as some people claim? Probably not. Did he weigh 300 lbs? Yes. Was he in thrall to Page? Probably. Was he a good father? Doubtful. Did he lose the plot? Yes. And so it goes on, scattering enigmas like notes in a Page guitar solo. 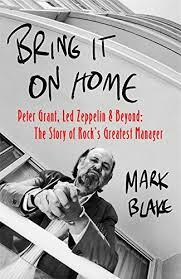 Bring It On Home is not the first biography of Peter Grant. That honour belongs to my former Melody Maker colleague Chris Welch who in 2001 wrote The Man Who Led Zeppelin, which I commissioned and edited for Omnibus Press. It is to Blake’s credit that although some information is bound to be repeated, very little from Welch’s book appears in Bring It On Home. It isn’t even mentioned in the extensive bibliography and Welch, who wrote about Led Zeppelin as much as any other writer from the music press in the 1970s, is barely mentioned. This indicates that Blake has not only been selective in his research – which is extensive – but is resolved not to plagiarise. Others in his trade are rarely so scrupulous. What Blake has going for him that Welch lacked is the co-operation of Grant’s two children, daughter Helen and son Warren, without whom he would have had to rely on a lot of the secondary research that, alongside his own experiences, fed Welch’s book. Both Grant’s children contribute extensively, offering both opinions and facts unavailable to previous Led Zeppelin biographers whose books invariably covered Grant’s life as a sub-plot. What we learn, unsurprisingly, is that home life with the Grants was not one of quiet domesticity, that their father was rarely off duty and, even when he was, if the phone rang and Jimmy Page was on the other end of the line he jumped to it. Helen and Warren’s participation ensures that the book is not just another Led Zeppelin book in disguise. Although Blake cannot help but tell the group’s story within his narrative, he diverts the attention away from them and back to Grant sufficiently for the book’s primary focus to remain intact. Though it lacks any new testimony from Page, Robert Plant or John Paul Jones, he’s secured fairly blunt interviews with many of those who worked for Grant, including second-in-command Richard Cole and some who remained by his side after the group’s demise. Their testimony confirms that it took a series of dreadful blows – his divorce, the 1977 Oakland incident, the death of Bonham, heroin addiction, what he viewed as betrayal by Page and Plant – to fell him, and it took him almost a decade to get back up again. After all, as he said himself, once you've managed Led Zeppelin what else is there to do? The book also benefits from an interview Grant himself gave shortly before his death to a researcher gathering material for the film that was to have been made by Malcolm McLaren. This has not been published before and we can safely assume that at this stage in his life Grant was likely to be more forthcoming about controversial issues. Some of this material, I am reliably informed, has been held back on the advice of lawyers. Nevertheless, the book contains fresh details of Grant’s deprived childhood, his mother (who was over six foot herself), his lack of schooling, his early jobs, his entry into the music business as a driver of pre-Beatles rock’n’roll acts and his apprenticeship with Don Arden with whom he had a spectacular fall-out. Conflicts were par for the course in Grant’s business life and in most cases the combatants were eventually reconciled though not in Arden’s case, nor, of course, with US promoter Bill Graham. Blake gives the nasty Oakland business the prominence it deserves and in the preceding chapters makes it clear that Grant’s increasingly bad judgement at this stage of Led Zeppelin’s career, ie after 1976, was caused by overwork, an inability to delegate and paranoia brought about by his dependence on drugs. By this time the karma surrounding Led Zeppelin was at its worst and I’m rather glad that my relationship with them, such as it was, ended that same year. Bring It On Home also offers some intriguing new information about the power structure that supported Grant. A shady character called Herb Atkin (aka Itkin), an ally of Grant’s equally shady US lawyer Steve Weiss, seems to have played a key role in oiling the wheels of Led Zeppelin’s unhindered accumulation of wealth and ability to avoid scrutiny from law enforcement. Unmentioned in any previous Led Zeppelin books, Atkin may or may not have been a CIA operative, or have had a connection with the mafia, but he certainly had useful contacts in high places. Atkin died in 1989 and Weiss in 2008, but Blake has uncovered evidence that both tried to take over Led Zeppelin from Grant after Bonham’s death; also that Weiss almost certainly benefitted financially from the group to an extent that Grant, and probably Page, were unaware. Bring It On Home is not without its flaws. Grant’s wife Gloria, nee Cutting, is under-represented which is surprising in view of their 14-year marriage and her children’s contribution to the book. What happened to her after she fled with Grant’s groundsman? We don’t know. According to Blake, Grant left Horselunges for a rented flat in Eastbourne. Was he broke when he died? We don’t know. Finally, according to Warren, the Inland Revenue were chasing Grant when he died. How much for? Did the stress of this contribute to his heart attack? We don’t know. Also, some of the stories sound to me like someone is gilding the lily, but then again without the stories the book would suffer. It would probably be too much to expect Mark Blake to answer all these questions about a man who was certainly secretive yet at the same time loved to create myths about himself. It was the myths that turned him into a legend, but if a legend is as the OED defines, Grant certainly qualifies and Mark Blake’s fascinating book does nothing to dispel that. 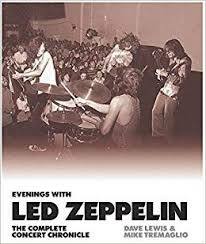 Once we’re into the main course, virtually every one of the 516 Led Zeppelin concerts the authors have been able to confirm is covered in as much detail they can muster, and that includes photos of the venue, inside and out, Zep on stage at that venue, ticket stubs, posters, press reports and, of course, set lists, followed where appropriate with details of any available bootleg recordings. The latter enables the authors to comment on the shows.